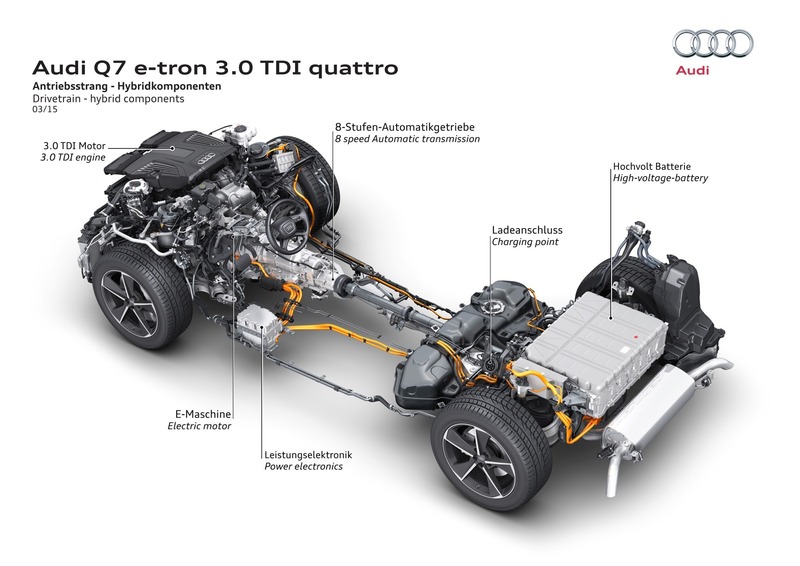 Audi has combined its world renowned diesel engine expertise with its equally widely acclaimed flair for technological innovation to create its first TDI plug-in hybrid with quattro all-wheel drive. Making its world public debut at the Geneva Motor Show, the new Q7 e-tron quattro combines a frugal TDI engine with lithium-ion battery technology for a potential range of up to 876 miles and the ability to travel emission-free for over 34 miles on electric power alone, contributing to an official CO2 figure of less than 50 grams per kilometre. 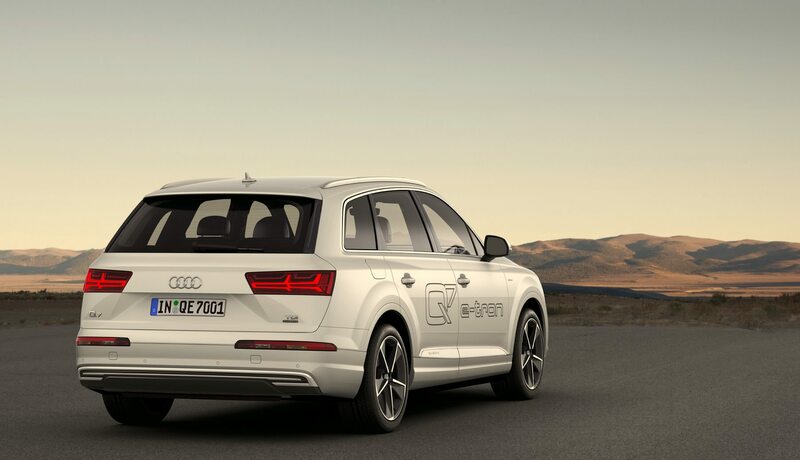 The Q7 e-tron quattro is the second Audi model with a powerful plug-in hybrid drive system. With a system output of 373 PS and 700 Nm (516.3 lb-ft) system torque, it accelerates from 0 to 62 mph in just 6.0 seconds, and continues up to a top speed of 139 mph. According to the relevant standard for plug-in hybrid vehicles, however, the large SUV can return up to 166mpg combined, corresponding to CO2 emissions of under 50 grams per km. This value too sets new standards. 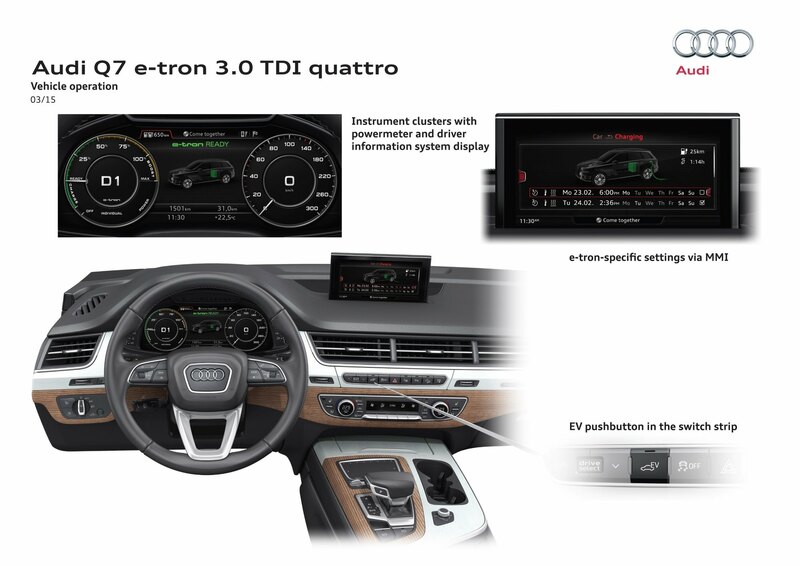 Like all Audi hybrid models, the Q7 e-tron quattro has also been designed as a parallel hybrid. The highly efficient 3.0 TDI is the latest-generation V6 diesel engine, delivering 258 PS of power and 600 Nm (442.5 lb-ft) of torque. Active engine mounts – a world first for a diesel engine – eliminate unwanted vibrations through selective counter pulses. The disc-shaped electric motor provides 94 kW and 350 Nm (258.1 lb-ft) of torque. Together with a decoupler, it is integrated into the eight-speed tiptronic. The automatic transmission is outstanding for its high efficiency and low weight. The quattro permanent all-wheel drive, also compact and lightweight, transmits power to all four wheels. During fast cornering, its center differential works closely with the wheel-selective torque control system, an intelligent software feature. 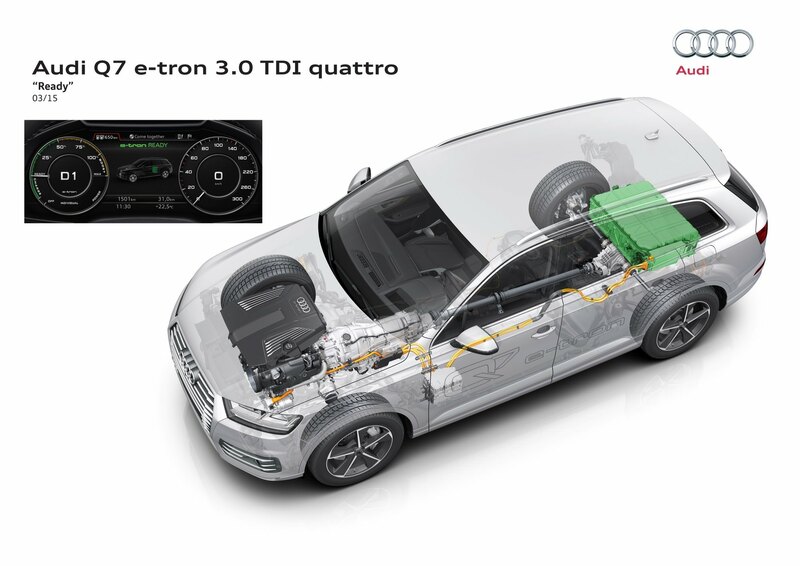 Another efficiency component is the standard thermal management system with integrated heat pump, specially developed for the Q7 e-tron quattro. This makes it possible for the waste heat from the electrical drive components to be made available to the interior of the Q7 e-tron quattro. Audi is the first manufacturer worldwide to introduce this technology in series production in a plug-in hybrid and is thus setting new standards in the areas of interior comfort, climate control efficiency and range in EV mode. As well as heating up the interior more quickly, the customer also benefits from a far-reaching electric driving experience.